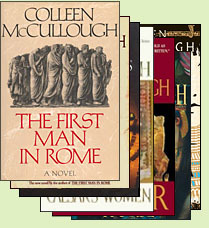 Colleen McCullough’s "Masters of Rome" series about the final days of the Roman Republic is one of the most surprising triumphs of recent decades. They trace eighty years of crisis that led to the end of the Roman Republic, beginning with the political duels between Sulla and Marius. Encompassing dire threats from barbarian invaders, civil wars, and a slave rebellion, they move at length to the rise of Julius Caesar, his victory over his rivals, his assassination, the struggles of his successors and the surprising triumph of his great-nephew and adoptive son Octavius. The novels are not for those who like short, swift books centering on romance or action-packed adventure. They are at heart huge, rich political novels, treating in detail the inner workings of the Republic and the unceasing struggles of ambitious men to use its institutions to gain fame and fortune. You will come away from them knowing more than you ever wanted to know about Roman offices, how the plebian assembly chose tribunes, how the Senate chose consuls, and the roles of praetors, questors, censors and the Pontifex Maximus. You will also travel deep into the private lives of the citizens, their dining halls and bedrooms, and across the breadth of the Mediterranean world to exotic lands where crucial wars were fought and won. The key to McCullough's success is the succession of great characters she creates. Decisive in her interpretation of well-known historical figures, she also brings to life an array of vivid female characters whose stories have been neglected in the short summaries of history as we know it. If you want to dive deep into another world, to take part in the struggles of scores of fascinating people whose swirl of loves and hates, skills and fatal weaknesses all played a role in the ultimate downfall of the Roman Republic, the "Masters of Rome" series is for you.